Battery startup Aquion Energy has unveiled the second generation of its low-cost battery that the company’s customers can plug into solar systems and the power grid. On Tuesday at the Solar Power International conference in Las Vegas, Aquion announced that its new battery can deliver up to 40 percent more energy for customers’ needs, in the same boxy size and shape. The seven-year-old company, based in western Pennsylvania, says it made these gains through core battery chemistry and more efficient use of the battery’s active materials. Aquion makes a battery from a combination of nontoxic materials including salt water, carbon and manganese oxide. The original technology was invented by Carnegie Mellon professor Jay Whitacre, Aquion Energy’s founder and CTO, and funded early on by venture capital firm Kleiner Perkins. Battery stacks and modules in Aquion Energy’s factory. Photo by Katie Fehrenbacher, Gigaom. I visited Aquion Energy’s factory earlier this year and Whitacre showed me the production line, with batteries piled up ready to ship. As of the end of July the company had made, and was in the process of shipping to customers, about 2 MWh worth of batteries. 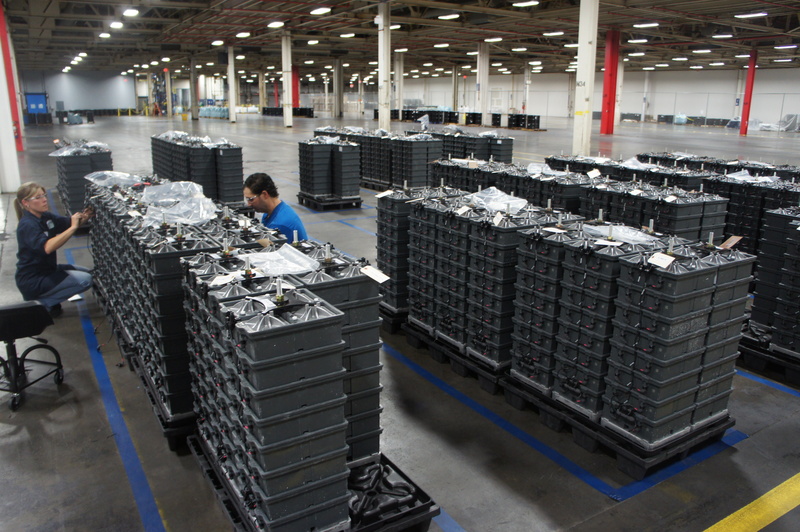 It intends to ship somewhere between 5,000 and 10,000 batteries by the end of this year. Venture capital funding was readily available when the company first started up, but by early 2013, VCs were far less willing to put funds into energy manufacturing companies. The huge, embarrassing losses around companies like Solyndra and Fisker had soured the market. Instead of raising money from VCs to build out its factory, Aquion turned to family offices and international investors including Tao Invest (the fund of billionaire family the Prizkers, who also own Hyatt hotels), Hong Kong–based fund Yung’s Enterprise and Russian firm Bright Capital, as well as high-profile billionaire and Microsoft co-founder Bill Gates. Aquion has raised over $100 million to get its batteries to market. 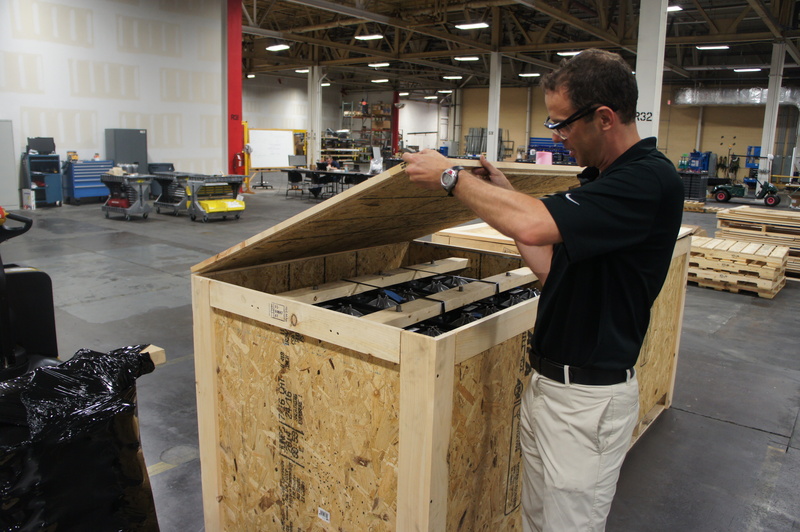 Aquion Energy founder and CTO Jay Whitacre inspects a battery that’s ready to ship to a customer. Photo by Katie Fehrenbacher, Gigaom. Aquion’s factory is the first of its kind from a startup at this scale. The energy storage market will potentially be worth tens of billions of dollars in the coming years. Solar companies are starting to install battery banks next to solar farms so that the batteries can store solar energy during the day to be used after the sun goes down. Remote communities are beginning to pair batteries and solar panels to disconnect from the grid. Down the road, utilities will more commonly buy these types of batteries to better manage the grid. Batteries have become a hot topic for the solar industry in recent years. Aquion is one of several startups — others are Ambri and Eos — that have been racing to get their new low-cost batteries to market. Large Asian battery giants have also noticed this market, and companies like Panasonic, with its partnership with Tesla, are moving in as well. Tesla and Panasonic intend to make 50 gigawatt hours per year of battery packs by 2020 from their huge factory in Reno, Nevada.